This is not my week for working with computers! My scanner died at the beginning of the week. I haven't been able to connect from the Internet at home for the past three days. And to top it all off, I've been trying to upload these pictures to Blogger for over an hour! Enough complaining already! With Dave's help I finished this pretty little box for a birthday present. I love little boxes! I found this one at Michael's (I know they don't use an apostrophe, but the English teacher in me just won't let me leave it out) thanks to Tattycat... I was looking for her wonderful thread winders! Dave sanded and stained the box for me. It's just the right size for Lyn Morton's Judith in size 20 HDT. This one's Tie Dye Blue from LadyShuttleMaker. I told Dave that I'd like to give little treasure boxes like these to our grandchildren for Christmas, and he liked the idea. Now all I have to do is find the time to get to Michael's and do the tatting... somehow my Christmas list keeps growing! Dave Stanbrough at Grizzly Mountain Arts had a beautiful nostepinde listed in his Etsy shop. I e-mailed him and asked if he could make a smaller version for thread, and he did! It's perfect for winding my HDT into little balls! For me, the big advantage to having balls of thread is that I can pull the thread either from the center or the outside... much easier when using a ball and shuttle pattern! I found this ball holder a few years ago (I can't remember where). It's perfect for holding my little balls of thread... I don't have to worry about them getting lost in the dust bunnies! Get right down to the real Knitty Gritty! My scanner seems to have squealed its last squeal. For months, every time I scanned an image, I would hear an unearthly squeal. Well, now it's official. No more scans! I had to bring my tatted lace to school for a scan, and I'm blogging on my lunch break... ah! a new diet plan! I can't justify a new scanner at the moment. The copier and printer functions still work, so I'll either take pictures or scan at school. Enough scanner woes... I finished tatting Mary Konior's Spinning Wheel last night in Marilee Rockley's Knitty Gritty, size 20. Yes, I'm still in love with this pattern! I have three more to go to finish my Christmas list. I'm tatting much slower these days, because I'm also knitting a shawl and a neck warmer. I have two baby quilts to finish, one in the next week, and one before Christmas. Why is it that my to-do list keeps on growing? P.S. - I just looked at my blog. This scan is terrible! Knitty Gritty is one of the prettiest color combinations I have ever seen. Hopefully, I will get home early enough to take a picture in natural light of this beautiful glass mat. P.P.S. - One skein of size 20 HDT will make this beauty with plenty to spare! I've lost count of how many I've made. Does that mean I've made too many? I think not! As for the scan... I looked at my blog at home and the colors looked fine. Of course, I always think my scans look better on my Mac at home than on my Dell at school. I think it must be a difference in the different monitors. I love the way this one turned out! This is one of the threads that Sherry Pence custom dyed for me. The whole time I was working on this, I kept thinking of Necco Wafers... anyone remember them? 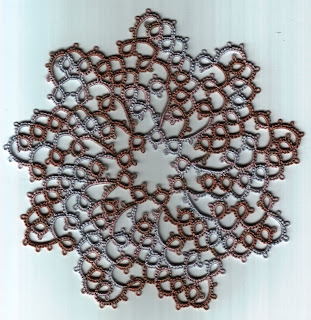 I was looking for an oval motif for a present I'm working on, and I found "Judith" in Tatting Patterns by Lyn Morton. I tatted both motifs out of size 20 HDT from Sherry Pence... Rainbow Sherbet and Tie Dye Blue. I tatted the Rainbow Sherbet first, but I was disappointed for two reasons: 1) I made my joins incorrectly, so the finished piece doesn't lie flat, and 2) it's too pale for the background it will be on. Sigh! I knew before I started that I was making the wrong color choice. Luckily, this is a very simple piece to tat (as long as you join correctly), so I tatted the Tie Dye Blue while we watched the Bears/Vikings game this afternoon. I think the blue will be perfect for the setting... I'll post a picture when Dave has finished with his part of the project. Pamela asked me if I would take a picture of all my Spinning Wheels together, so here they are! I made two others last year, but I obviously put them some place very safe... I can't find them! How long does it take YOU to tat the Spinning Wheel pattern? I'd love to hear from all of you who have tatted this design. It takes me about an hour for each spoke or arm of the pattern. There are 9 spokes, so approximately 9 hours... if I don't have to retro-tat! I think I'm a very slow tatter, especially after watching videos of others tatting. I don't care how long it takes, though... it's my way of relaxing! Earlier this year, I posted about our library theme for this school year... "Weave your way through the library." My students started out weaving on an inkle loom. They really enjoyed this, but we had an unfortunate incident at our fall open house... some curious child pulled the weaving off the side. I haven't gotten around to fixing it yet, but all is not lost. There is enough completed weaving to make several bookmarks. ...and three almost ready to come off the looms. We'll make something for our new principal out of these weavings at the end of the school year. I took one of my Weaveette looms to school to show the students how a pin loom works. They loved it! I've ordered another one to keep at school for student use. The kids liked the bookmarks I was weaving so much, that I decided to weave some for our Santa's Secret Shop. Our school colors are green and gold. I couldn't find the exact colors I wanted, but the kids really seem to like the Pistachio and Lemon Zest Read Heart Designer Sport that I chose. I started on our road trip last week. I was able to weave 47 plain weave bookmarks from the skein of Pistachio. For the Lemon Zest, I decided to follow the patterns in my book Modular Textures: Patterns for the Weavette & Weave-It Looms by Licia Conforti. I've complete 11 bookmarks so far. My goal is to weave two skeins worth of bookmarks to donate to Santa's Secret Shop. It takes me about 20 minutes to weave a bookmark. I would dearly love to tat bookmarks for Santa's Secret Shop, but I know I could never tat as many as I can weave! Yes folks, I am still tatting Spinning Wheel glass mats... I LOVE this pattern! I think it looks especially nice in Marilee's "Sugar Maple", size 40. This one's 4 1/2" in diameter, about an inch smaller than the ones tatted in size 20. I still have one more that I must tat for a Christmas present. I'll have to see if I want to keep tatting Spinning Wheels, or if I want to move on to a different project. Tatting these little doilies gives me a feeling of accomplishment. 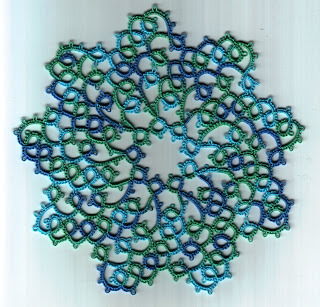 I like tatting motifs, and I'm usually very pleased with the final product, but the glass mats seem a little more useful to me. Besides, I love doilies! I may have to put tatting aside for a little while... I hope not! I have several knitting projects in the works, a couple of crochet projects, a birthday gift, tooth fairy pillows for grandchildren, and weaving bookmarks for the Santa's Secret Shop at school. My "to do" list just keeps growing! 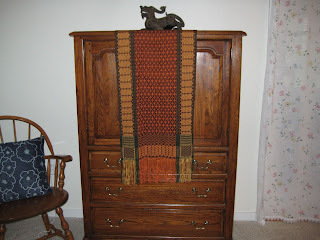 This is a Thanksgiving table scarf that Mom just finished weaving for my sister Janet. Isn't it gorgeous? Mom found a mistake when she was finished... remember that blind man on the galloping horse, Mom! ...so she's planning on weaving another with no mistakes. I am so lucky to have such a talented Mom! October 10 was our 28th anniversary, so Dave took me on a road trip to see the changing of the leaves. The colors in the Door County peninsula (Wisconsin) were fabulous! ...and climbed to the top... all 97 steps! Yes, I made it... by stopping on each of the landings and waiting for the burn in my calves to ease up! The view from the top of the lighthouse was fantastic! We stopped in Sister Bay for lunch, then continued around the peninsula to the Door Peninsula Winery. We took the tour, did a little wine tasting, and bought a little wine before leaving to head for the Nicolet National Forest. We didn't see much color there. After a good night's sleep, we headed home via the Kettle Moraine Scenic Drive. The sun was so bright, that most of the pictures I took look washed out, but this tree sure was a beauty. This is the Greenbush Kettle near the beginning of the Drive (north end). A kettle is "a deep ground depression formed when thick layers of glacier-deposited sediment settle over a melting ice block" (National Geographic Guide to Scenic Highways and Byways). Needless to say, we had a wonderful, relaxing weekend. Can you guess what my next tatted piece will be? I'll give you a hint... think Marilee's "Sugar Maple" and Mary Konior's "Spinning Wheel". I can't help myself! I just keep on tatting these beautiful little glass mats... I can't wait to see how the pattern looks in different threads! Coral Reef size 20 HDT by Pamela Myers is a fabulous thread to work with! If you haven't tried HDT yet, please check out the threads available from Pamela, Marilee, and Sherry... they're all wonderful! I can't say that I prefer one person's HDT over another. Each of these talented ladies has her own sense of which colors work well together, and I love every thread I've ordered from each of them! This one seemed to take forever! I think a big part of that feeling comes from the fact that I love watching the color changes in HDT. Obviously, there's no color change here. This is Lizbeth size 20, color #693 from Handy Hands. I'm pleased with the final doily, but the next one will be in HDT! Which color? It'll be a surprise! 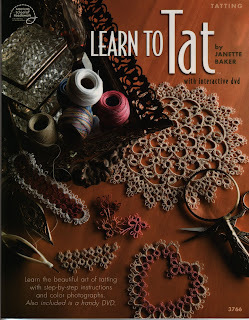 Did I need to buy another tatting book? No! 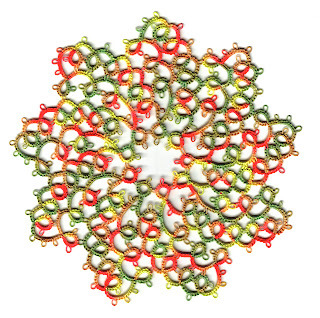 Did I need another tatting video? No! Am I glad I purchased this one? Yes! If you know anyone who is interested in learning to tat, I highly recommend this book/dvd combo. I just finished watching the entire dvd. It has about 1 1/2 to 1 3/4 hours of instruction (I took a few phone calls, so I'm not exactly sure how long it is). The video picture is clear and the instructions are easy to follow. Janette's voice is soothing, which is important to someone like me who can become easily frazzled! Janette refers to the kit. I did not purchase a kit, just the book with dvd. 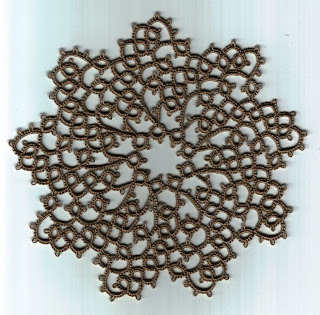 If you choose to purchase this book for a new tatter, be sure to include 2 Clover tatting shuttles, 2 colors of size 5 crochet cotton, and 2 colors of size 10 crochet cotton. These supplies will allow the new tatter to follow Janette's instructions exactly. The book includes written instructions and photos from all 9 classes presented on the dvd, followed by 9 projects ranging from beginning to intermediate. At the back of the book, there's a stitch guide for easy reference. 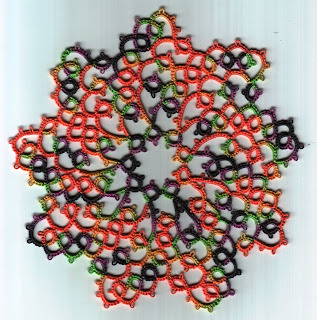 I was pleased to see clear instructions (both book and dvd) for split rings, split chains, and front side tatting, including an explanation of the reasons for using these techniques. How did I find this gem? My friend Denise saw it in her Annie's Attic catalog, and called to let me know about it. I almost didn't order it, but I'm glad I did. I'm not sure where to purchase the kit. I did a quick Google search and saw that this book is available from Lacis. I'm sure there are many other vendors carrying the book/dvd and possibly the kit. I paid about $20 with shipping and handling... what a deal! Are you ready to learn to tat, Jo?